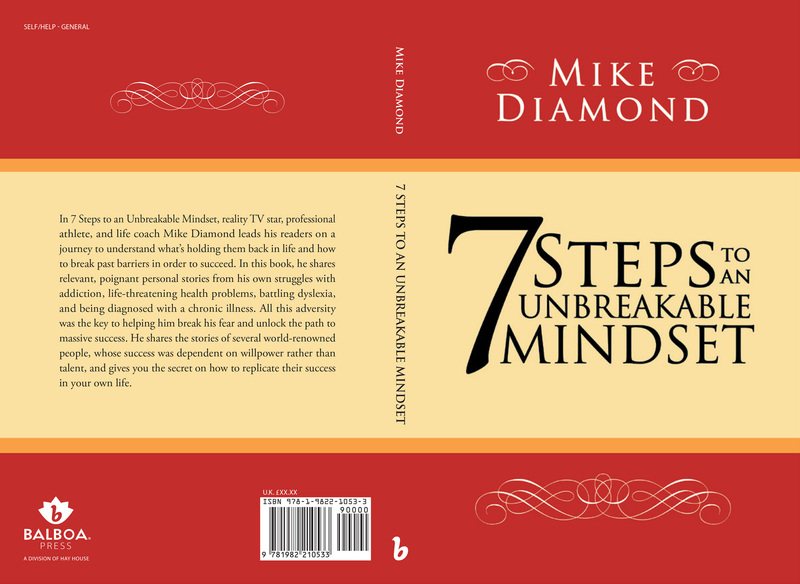 In 7 Steps to an Unbreakable Mindset, reality TV star, professional athlete, and life coach Mike Diamond leads his readers on a journey to understand whats holding them back in life and how to break past barriers in order to succeed. In this book, he shares relevant, poignant personal stories from his own struggles with addiction, life-threatening health problems, battling dyslexia, and being diagnosed with a chronic illness. All this adversity was the key to helping him break his fear and unlock the path to massive success. He shares the stories of several world-renowned people, whose success was dependent on willpower rather than talent, and gives you the secret on how to replicate their success in your own life. I just finished this book, and it is truly transformative. The author writes this like he is in your living room talking to you on the couch. It is very readable and relatable. The stories he tells about some very notable people are inspiring, but what I found more inspirational was the author's personal stories. His ability and will to overcome so many obstacles, and still find a way to not only succeed but help others succeed is what everyone should work every day towards. I really like how the author moved between storytelling and detailed plans of execution and transferable action items for me to apply in my everyday life, it kept me engaged and excited to keep reading. I was never bored. The author was very direct and to the point, there wasn’t any fluff or filler. I would recommend this book to anyone who is interested be a better version of themselves, actually the BEST version of themselves, that they can be. Mindset is the key to anything worth doing, and this book is the roadmap to that pursuit. This book is inspiring to everyone. It's real, it teaches you that you can do anything no matter what. I love the stories of his life and how he's pulled through it all. It's a book I will always go back to when I need inspiration and to remind myself sometimes we go through things to get us where we are today. It's easy to read and to the point. There are few people in this world that are true living examples of what they preach and are passionate with sharing their gift with the world. Throughout this book, Mike Diamond shares his personal life details and hardships with demonstrating how he has overcome them with his mental blueprint to commitment, discipline and fearlessness . The weight of our fears, failures hold no presidence in what can be achieved with our mindset is aligned. Those who are committed to becoming a better version of themselves will find inspiration here ! This book was such a great read! It was easy to dive into the content and grasp the hands-on nature of the material. If you're ready to change your life but you've never ventured into the self-help genre before and are tentative about what steps to take, this book is for you. It's a workbook style of writing and exercises makes the content feel less daunting on the reader's journey inward. It is great for readers of all ages, looking for a boost to their self-esteem, their life path or just reconnecting with themselves. Solid advice to change the way we're program and change the perception of our mind. Mike gives detail into the obstacles he's had to endure. Recommend for anyone who's looking to kick start their own focus and mindset or for those who need a refreshment. This Book has changed my life .. I feel positive and feel better about life and myself... It is very motivational. I recommend this book to anyone that needs a push of Encouragement. This book speaks to me. I could relate to everything Mike talks about. I brought it with me on a spiritual journey I went on to Tulum, and it helped me immensely, Mike was with me the whole time, protecting me. So for this, I thank you! Using the battleground of his own trials and experiences, he sheds light on some empowering truths. With plenty of practical tools to help put them into action and achieve the outer and inner results. Wonderful! This book was exactly what I was hoping it was. Met all expectations. It has totally empowered my “mindset”. This writing is a reality check that would benefit anyone! The most inspiring book I’ve read. It has motivated me to do things that I thought was impossible. Mr.Diamond is an inspiration. This book is such an easy read and really will transform your thought process. I’m so happy my friend recommended this powerful book. Done I love how straightforward the book is. Very helpful and changing my perspective on how to play my cards. For someone who has dealt with a lot of negativity in their life and lots of ups and downs, breaking out of that mindset has always been a little difficult. I never respond well to coddling or soft truths and this book is not that which is perfect for anyone to really get their life on track and take a good long look in the mirror. I have read a lot of books similar to Mike's but none have quite got me out of that place so I'm stoked I finally found a writer/speaker that can do that for me. I definitely recommend this to anyone looking for a wake-up call. If this book won’t get you up and going, then maybe nothing will. It is the ultimate guide to motivation. It’s written in a way where it doesn’t come off as stuffy. It’s a modern take on self-help and really getting it done. Quick read! You’ll love it. I did. I have known Mike Diamond for over 18 years. Everything he has endeavored has been a success. Nothing has come easy to Mike. I have the utmost respect for his honesty and insight he has very candidly shared in his book Unbreakable Mindset. He is an inspiration to me and many others. This book is an easy read, very relatable and keeps you moving in the right direction should you choose to implement Mike’s suggestions. Well done Mate!!!! My family and I met the author, truly inspirational. I devoured his book in one night. Highly recommend. An incredibly inspiring and motivational book that provides you with the necessary tools to change your perspective, and thus change your life. In this easy read, Mike teaches you how to change your mindset so you can make positive changes in your life. We're always growing and evolving as humans, and I truly believe this book can help everyone! In today's world the more positive input we have the better. Mike writes from the point of view of experience. He has been there. and the results he gets from should inspire all of us to live more in ourselves. Get a copy, read it, and then revisit it periodically. You'll be glad you did. This has now become one of my favorite self-help books. It’s Very easy to read and understand. The principles are sound and very effective when put into daily life. Mike’s story and the obstacles he overcomes on a daily basis are truly inspirational. I hope this is the first of more books to come by this new author. Very inspiring. An easy read which is a lot coming from someone who RARELY reads lol. Definitely recommended. I don't write reviews very often, especially self-help books as I feel they are just a combination of other peoples ideas but I must say I found 7 Steps to an Unbreakable Mindset very compelling and very inspirational. I love how the Author blends his own stories into detail planning and action. Major obstacles the Author had to overcome is truly inspiring and has helped me take action and find the best version of myself. The Authors passion resonates off the pages and his writing is incredible as it is so hard to make things sound simple with so much impact. I would highly recommend 7 Steps to an Unbreakable Mindset to anyone who is willing to take on life with a new mindset. This book is the key to taking yourself to the next level!! Copyright © 2013 - The Mike Diamond | All rights reserved | Made with ♥ in NY.